Classic Cut by Raquel Welch has a basic silhouette but is anything but ordinary. Made with the Tru2Life fiber, this above the shoulder cut can be worn straight, curly, or wavy. The full cut bang and monofilament crown add a superbly natural finish. Also available in gray colors, beautiful shades of grey! Monofilament Crown - Creates the illusions of natural hair growth where the hair is parted. 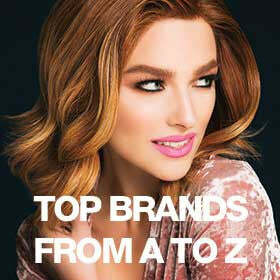 Tru2Life Heat Friendly Fiber - Looks and feels like human hair and can be styled with heat tools. Approximate Length: Front 4" | Crown 10.25" | Sides 7" | Nape 3.5"